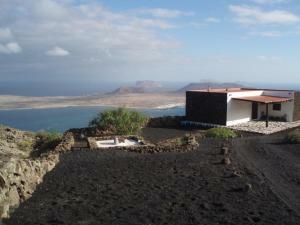 Discover the Mirador del Rio Viewpoint in Haría, Lanzarote. The Mirador del Rio Viewpoint is localized in the municipality of Haría, on the north region of Lanzarote, in the Canary Islands. Located at 480 meters above the sea level and enclosed in the Risco de Famara, from the El Rio Viewpoint you might observe one of the most spectacular marine landscapes in the canary islands’ archipelago. This splendid viewpoint was designed by César Manrique, which converted an old military position , known asm “River Batteries” into one of the most amazing views you might get from this island. 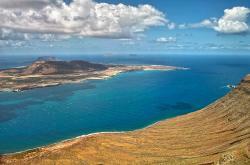 It’s known as “the River - El Rio”, the arm of sea that separates the islands of Lanzarote and La Graciosa. This popular sea section has assisted many important historic events. Through here many phoenician and roman boats passed, leaving many archaeological remains on its deepest surface. When arriving at this El Rio Viewpoint, you’ll be firstly surprised by the semi-circular amphitheater, built on rock, where the general reception is installed. The main idea from its designer, César Manrique, was to hide the incredible landscape until the very last moment, for an amazing surprise. From this site you’ll be able to see the impressive panoramic view over the chinito archipelago (formed by the islets of La Graciosa, Montaña Clara and Alegranza). 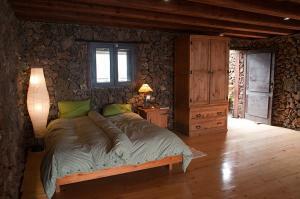 This place as well as the Roque del Oeste and the Risco de Famara were officially classified as Natural Protected Site. Without any doubts the El Rio Viewpoint deserves a quiet visit, due to its sober style integrated with the natural environment. Moreover, on its interior you’ll also find many interesting sculptures built from junk and disposable materials, used not only to break the acoustic yet also to ornament its interior, making it an authentic piece of art. 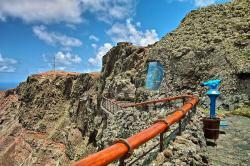 To get to the El Rio Viewpoint it’s advisable to rent a car in Lanzarote, and head to the municipality of Haría. You might do this through two ways, depending on your position on the island. You might catch the LZ-10 through Haria and then the LZ-202, or catch the LZ-1 till Arrieta and then follow the LZ-201.